Otago is a great hilly swathe of New Zealand’s South Island, including historic Dunedin, the old gold rush belt, the Otago Peninsula - known for its wildlife - the wonderful wine country of Central Otago and the Waitaki River region and lush Waitaki Valley. The best places to stay in Otago range from Dunedin’s small city boutique hotels to remote farming lodges. The main city in Otago is Dunedin and for many people this is an easy base for exploring the Otago Peninsula, which is a very popular spot for visitors with its amazing and accessible diversity of wildlife. There are penguins, sea lions, fur seals and albatross, just as a rule, and at different times of year you can see all sorts of other wonders from migrating seabirds to whales and dolphins. One of the most popular ways to see this vast, scenic region is slowly - with many opting for the Otago Central Rail Trail, which sounds like a train journey, but is actually a cycling route. Dunedin is Otago’s largest city and often referred to as the Edinburgh of the South, this is because of its Scottish heritage. This is a lively student town with a great live music scene and some lovely Victorian buildings in the city centre. The other option as an Otago Peninsula base is Omaru. This is a sleepy, eccentric town known for steam trains and penny farthings, hip boutiques and galleries run by antiquarians and bohemians. It’s the opposite of Dunedin almost, but an extremely unique place with some of New Zealand’s best preserved Victorian architecture. Central Otago is scattered with tiny towns which sprung up during the gold rush and have never quite petered out. Many of them are now finding their second (or third) winds as charming sleeping and eating stations along the Otago Central Rail Trail. Some of the prettiest towns are Clyde, Naseby and Cromwell, which also has a wonderful farmer’s market. The Waitaki Valley is a greener part of Otago with hills and valleys, some flooded into lakes. This is a great place for salmon fishing, waterskiing and wine tasters looking for fresh ground. 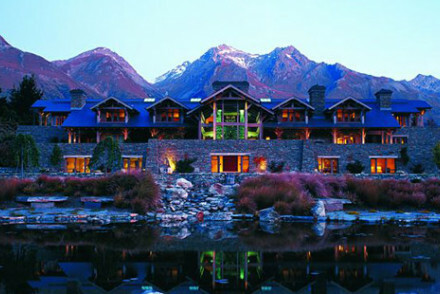 Kinloch Lodge is a heritage lodge on the shores of Lake Wakatipu. They offer a range of accommnodation including shared bunk rooms from under £20 per person per night. It's the perfect base for keen walkers and outdoor enthusiasts. 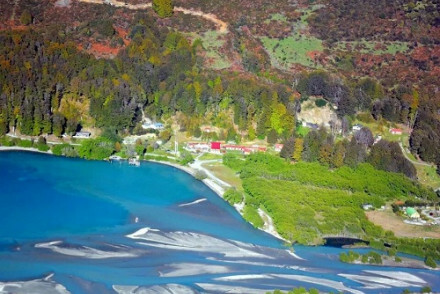 Blanket Bay is a sheep, cattle and deer farm right on the shores of Lake Wakatipu, which has opened part of its luxurious lodge to guests. There are 12 rooms available, with open fireplaces, charming antiques, exposed timber beams and most importantly, private balconies overlooking the bay. There’s great riding opportunities on the farm, and also great mountain biking. If you'd prefer your own space, don't hesitate to visit our online partner Booking.com for a variety of properties to guarantee a memorable experience for visitors of all requirements. Fly to Dunedin Airport, located approximately 28km (17 miles) from Dunedin. The airport has several domestic connections to New Zealand cities, including Auckland and Wellington - alongside an international link to Brisbane. Best time to visit - the summer from December to February offers the warmest weather for exploring dramatic scenery. Although, the plentiful activities offered by the cities means there's things to do all year round. Range of accommodation at the north end of Lake Wakatipu, from shared dorms to delightful double ensuites. Communal kitchen, restaurant, outdoor hot tub and stunning lake and mountain views. Fabulous watersports and a great base for Routeburn, Greenstone, Caples and Rees and Dart walking tracks. Set on a sheep, cattle and deer farm on the shore of Lake Wakatipu, this luxury lodge has open fireplaces, schist stone and timber beams. Rooms with antique furniture, large double beds and private balconies overlooking the bay. There is mountain biking and riding on the farm.